Control and estimation theory and their aerospace applications have been used for more than 50 years. Yet, this is the only single course that puts these two important and useful topics together and demonstrates their practical aspects in detail, as well as provides MATLAB/SIMULINK-related tools for real industrial problems. Instruction presents theories and related tools proven to be the ultimate analysis and synthesis tools and methodology to capture the issues of control and estimation fundamentals, implementations, and the essential trade-offs between them when applied to real-world problems. The course covers three major topics with hands-on lab experience: control basics, estimation basics, and advanced case studies. The course provides numerous aerospace design examples, including spacecraft attitude control, supermaneuverable fighter flight control, large space structure vibration control, disk drive suspension servo control, spacecraft attitude determination covering Kalman filtering, and advanced filtering. 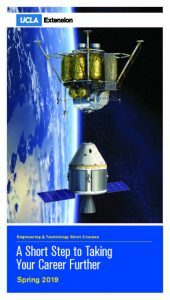 GPS position estimation for spacecraft attitude control also is illustrated in detail. Through the course’s control and estimation design tools and methodologies, participants gain the basic knowledge and powerful MATLAB tools to solve practical real-life problems. Participants receive lecture notes and published papers on the first day of the course. These materials are for participants only and are not for sale. Richard Y. Chiang, PhD, Boeing Technical Fellow, Flight and Control Engineering Department, Space and Intelligence Systems, Boeing, El Segundo, California. Dr. Chiang is a nationally and internationally recognized expert in robust control system design and system identification. He is the leading author on the MATLAB software, Robust Control Toolbox, of which nearly 25,000 copies have been sold worldwide across industries and academia for the last 15 years. His control design methodology has become a universal standard in the field. Dr. Chiang began his career 30 years ago as a control system analyst at Garrett AiResearch. During the 1990s, he also worked for Northrop Aircraft on F-18 supermaneuver flight control and at JPL on large space structure vibration control. Since joining Boeing in the late ’90s, he has designed attitude control systems for 10 satellites and analyzed system stability for 15 programs. He has taught senior control courses at USC and has given control seminars at DEC, Northrop, General Dynamics, and JPL in the 1990s and several at Boeing from 2002 to the present. He also has published 17 journal papers and 45 conference papers, and has three issued U.S. patents and seven patent applications pending related to spacecraft control system design.